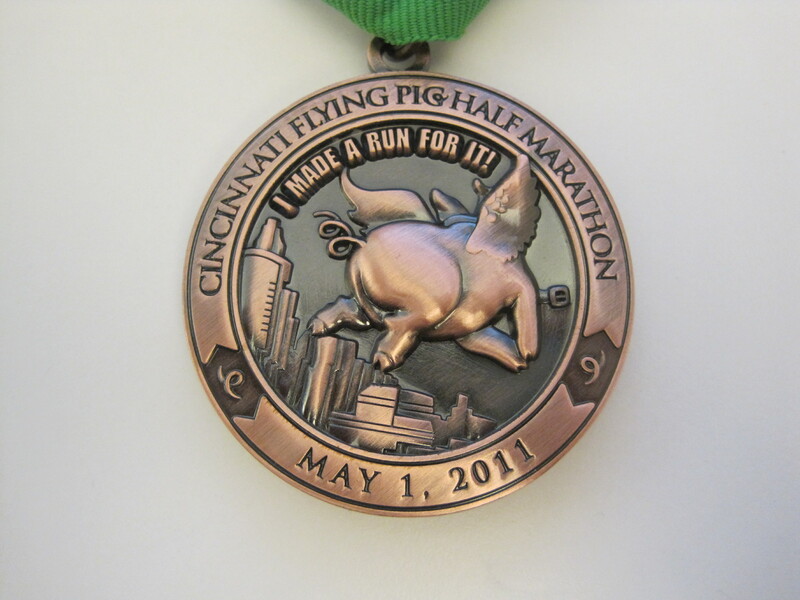 The Cincinnati Flying Pig Half Marathon was a mystery to us. It’s nationally known, fields a huge number of racers and garners national attention in the running world. But why? It doesn’t offer huge cash prizes for winners, so the finishing times aren’t even close to world or national records. Cincinnati isn’t an enormous, sprawling metropolis with unique manmade or natural landmarks and the race is only in its seventh year so it hasn’t had that much time to cultivate a large following. So why is it, like such others as Grandma’s Marathon and Big Sur, one of those “name” races that everyone seems to know? Is it the cute, porcine theme? Or has the medal become a collector’s item? Several months ago, as I was putting together my tentative race schedule for 2011, I made plans to answer these questions. I had originally planned on making it part of an epic weekend consisting of two half marathons, one on Saturday, one on Sunday. But a coworker with a 2:57 marathon PR advised me against it, telling me it would kill my legs. 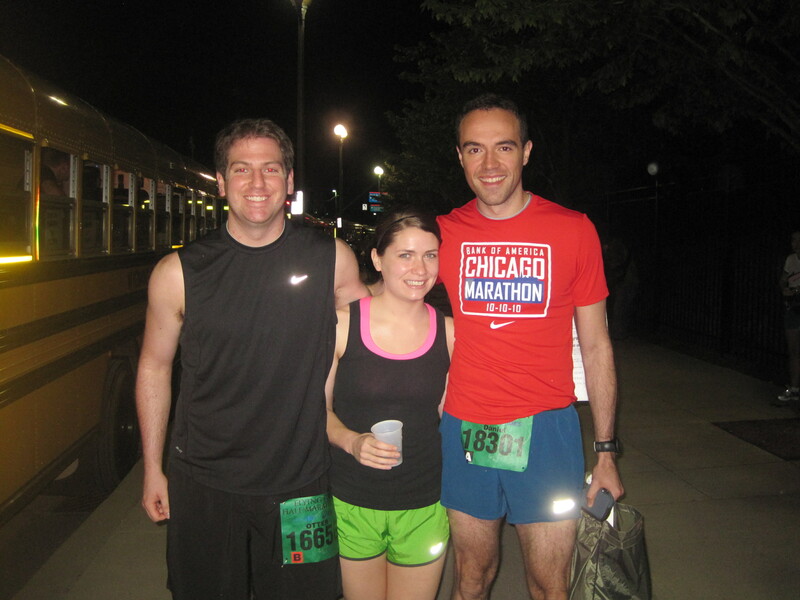 So I tempered my manic running plan and kept just the pig race. Around mid-January, before catching a free screening of Jason Statham’s “The Mechanic,” I was talking to our friend Mike about the race. I had apparently forgotten that he grew up in Cincinnati because he immediately invited me to stay at his house for the weekend. As the months counted down, two of my close friends, Laura and Otter, got equally excited about the famed race and laced up. And just like that, a fun weekend getaway had materialized. The trip began Saturday morning at 8:00 AM. The four of us drove out from Chicago and made it to Cincinnati by around 2:00 PM for a pasta lunch. Contrary to what this picture indicates, it was a very lively and jocular car ride, largely populated by crude jokes that incorrigibly stung Laura’s delicate, feminine sensibilities. After navigating the serpentine Flying Pig Expo at the Duke Energy Center, we were ready to make our way to Mike’s house to settle down for the day. 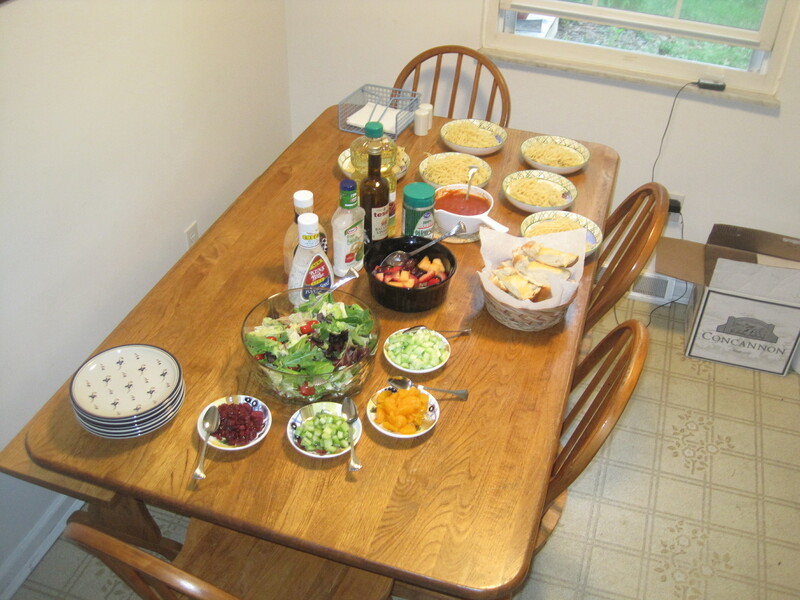 We got settled in our respective rooms, met his mother and younger sister, a few of his hometown friends and were later treated to a very generous and delicious dinner. Between the fruit salad, garlic bread, noodles and Angel food cake, we had stuffed ourselves with carbohydrates like someone packing for a month-long vacation with just a bookbag. By 10:30 PM (also known as the pathetically early 9:30 PM Central Time), we were in bed, crossing our fingers that the next day’s forecast proved wrong. … until Cincinnati. We had been tracking the weather all day and, despite a picture-perfect Saturday, clouds and lightning had rolled into the area by 5:00 AM the next day, striking the horizon with baleful flashes of light. After parking by the Paul Brown Stadium, home of the Cincinnati Bengals, we walked two minutes to the start line keeping a watchful eye above. It was shocking how simple getting to the start was – no traffic, no mile-long marches to gear check. Everything was neatly and tightly arranged around the stadium. However, by this point, we had also started feeling tiny rain drops. By 6:30 AM it was legitimately raining. The night before, I had declared at the dinner table that, unless the weather was awful, I was going to try and attempt a PR. I felt like my training had been going well, I had no nagging injuries, so why not? Though the rain was out as predicted, it wasn’t heavy enough to dampen my resolve. With the sound of the cannon, I was off with that nervous excitement that always accompanies the first mile of any race. 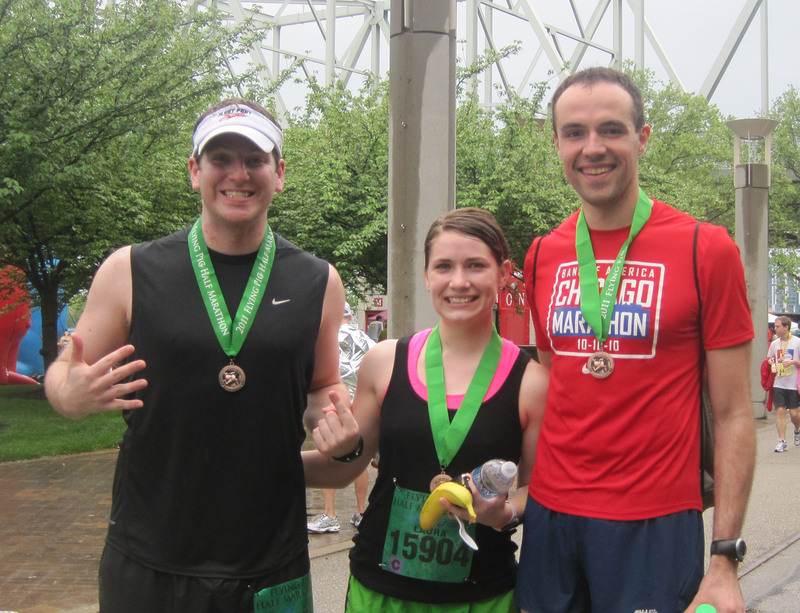 The course starts just south of Paul Brown stadium and hugs the Great American Ball Park, where the Reds play. Rather than continue into downtown Cincinnati, the course veers right over the Ohio River, into Kentucky. The next two rainy miles would be run along the Newport and Covington neighborhoods on the tip of northern Kentucky before ushering runners over the CW Bailey Bridge, back into Ohio. I don’t remember that much of these miles because I ran them with wet, foggy sunglasses. By mile 4, the rain had diminished considerably, but umbrellas and spectators hiding under every awning were still a regular sight. It was at this point, as the race dashed westward on West Third Street, that I saw a trio of musicians, none older than seventeen, huddled inside the jut of a building, as if in a very narrow alley, playing music for the runners. At that moment, they were playing Stone Temple Pilots’ “Interstate Love Song,” an anthemic tune which would ring in my ears for many more miles to come. To those kids, who probably weren’t even alive when the album Purple came out, I salute you. At this point, I was committing to my goal: I was running at a 7:17 pace, racking up some fast miles as a cushion for the big hill to come. 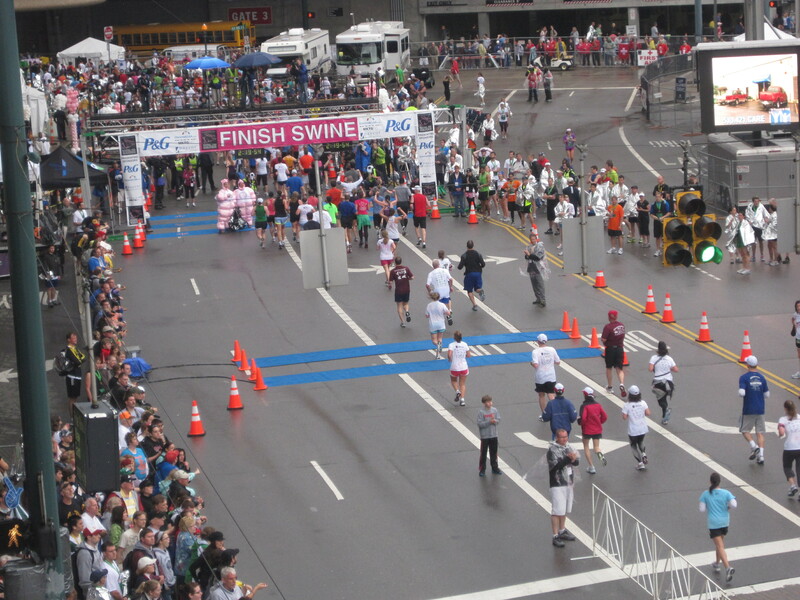 The fifth mile of the race cut in a straight line through the heart of downtown Cincinnati on East Seventh Street. Eager spectators with signs and noisemakers filled both sides of the street, buildings rising from the sidewalks, keeping runners focused on the hilly terrain just outside the city. Once past Seventh and Main, the rising lump of earth known as Eden Park was impossible to ignore. Fortunately, we didn’t scale the hill directly, but instead turned left and took a less pronounced route. It was at this point that the race’s urban character turned into a very picturesque run through tree-lined roads and scenic views of the city and river. Prior to running, we had all psyched ourselves out about this part of the race, so the hills themselves weren’t as murderous when we actually ran them. By mile 8, we had reached the zenith of the course and only a few more dips and climbs separated us from the much-anticipated 3-mile downhill. 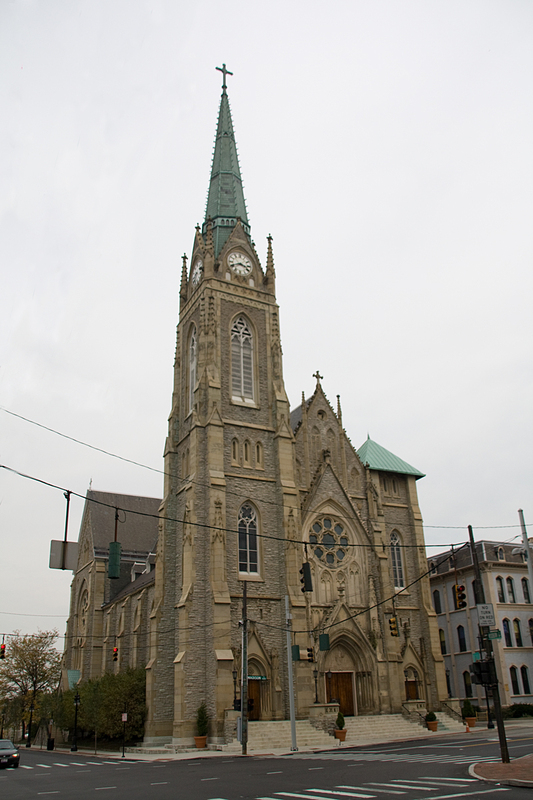 Before that could happen though, we ran through the quaint streets of Walnut Hills toward the awe-inspiring St. Francis de Sales Church. A mile later, I would be zipping downhill on Gilbert Avenue, trying to stay on my toes, as if in a permanent state of falling forwards. I had kept a 7:34 pace until now, just three seconds shy of my 7:31 Disneyland pace, and with only downhill miles left, I was confident that a new record was not only possible, but very likely. Three 7-minute miles later, I was at the final stretch on East Pete Rose Way, the Finish Swine and a new personal best in sight. Seeing the yellow clock under the pink finishing banner, counting up the seconds, water squishing in my shoes with every step, I increased my turnover, kicking at a 5:50 pace over the blue mats and stopping the clock at 1:37:24. 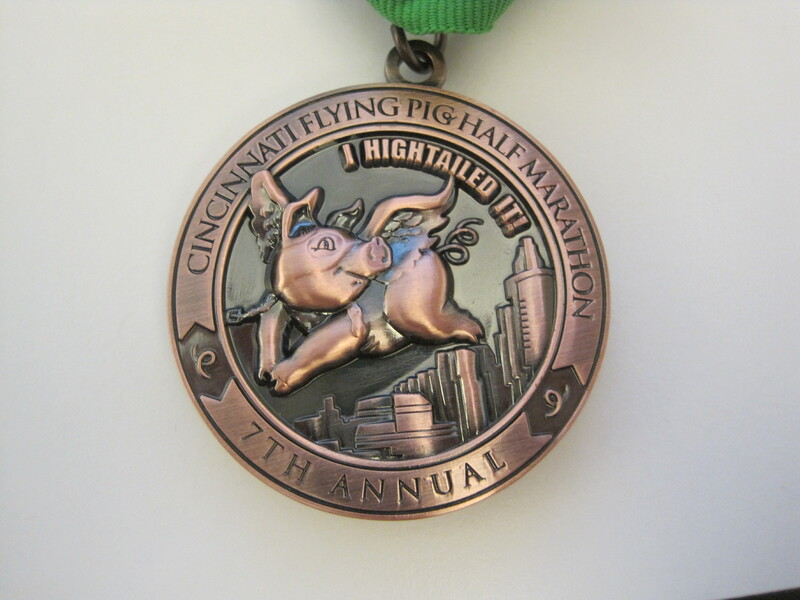 I threw a proud fist in the air and collected my copper brown medal, an airborne pig and the city skyline decorating both sides. Laura ran the first 6.8 miles of the race at a 9:07 pace for a variety of reasons. She may have started off at a slower pace to conserve energy for the hills between miles 6 and 8. At one point, she said she wasn’t feeling great, so she stopped for a bathroom break, which would definitely have slowed her down. However, she picked it up considerably in the remaining 6.3 miles with an 8:13 pace, finishing in 1:54:06, a PR by almost a minute. Otter ran the first 6.8 miles at a faster 8:39 pace, but didn’t speed up with the same gusto as Laura, due to discomfort in his calves on the downhills and an actual beer stop. With the remaining 6.3 miles run at an 8:41, he finished in 1:53:49, a mere seventeen seconds ahead of Laura, but enough to secure a victory and ending their much-hyped rivalry. So what was the allure of this race? Why did so many people register and run what is becoming one of the most famous races in the country? The three of us decided that it was a combination of elements: a varied and scenic course, lots of very enthusiastic crowd support and yes, the pig theme. The icing on the cake was a generous finishing chute, with everything from fruit to granola bars, yogurt, chips and chocolate milk. Having all three of us finished with proud times, we spent the rest of the day soiling the benefits of burning 1,500+ calories before 9 AM. We ate a combination of plates at Skyline Chili, each one highlighting their eponymous product. Laura ate a chili bowl, Mike scarfed down spaghetti with chili, and Otter and I chowed down on some chili cheese dogs, joking that they were the pigs that couldn’t fly fast enough. 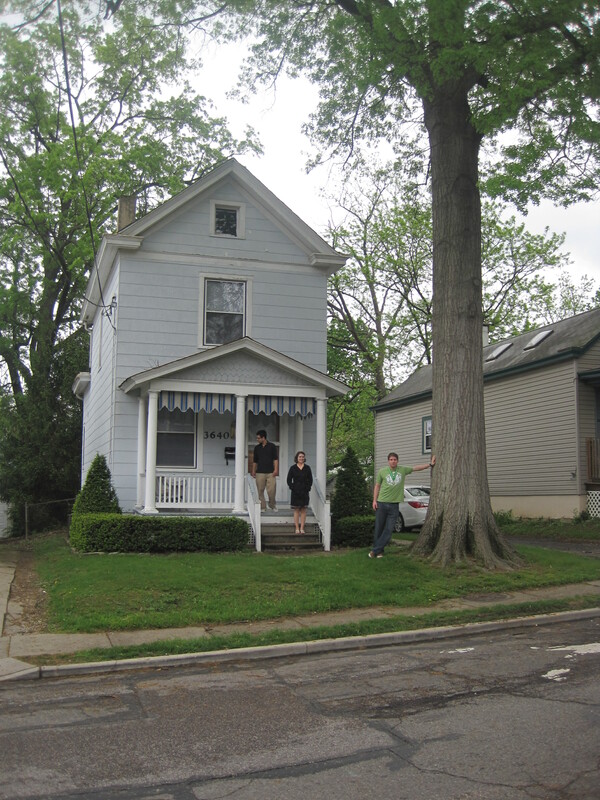 After that, we went to go visit Mike’s new house, into which he will move on May 17 with his girlfriend Miriam. The two of them have lived in Chicago for several years now and will shortly take the next step in their lives together, but this time with a back yard and a basement. Following this poignant visit, we went to Graeter’s for some cookie dough and black raspberry ice cream. Around 1:30 PM, having stayed in Cincinnati for just under 24 hours, we made the drive back to Chicago and on the way, because we hadn’t quite punished our bodies enough, stopped at Wendy’s. Ah yes.. Otter has come out victorious. Looks like a certain pundit was correct with his laconic views of history; views that might lead some to call him a chauvinistic pig (swine joke). I love your blog. Hmmm. A marathon in every state!? I’m mostly a CA runner!! You should have been at the LA Marathon if you like running in a monsoon! I have always heard good things about the Flying Pig. Your recap made it sound like a really awesome race. I love your goal! A race in every state is insane, but will make for lots of great memories and lots of awesome medals!